Khalsa Aid groups volunteering for the help of Kashmiri students in Chandigarh. When a militant was killed in a June 2017 encounter, Aniqa Shah accompanied her classmates out of the college as authorities ordered quick premises evacuation. “The college authorities didn’t even think about our safety!” regrets Shah. In a conflict-ridden Kashmir, students suffer the most. Frequent shutdowns, interrupted facilities and a threat to life have pushed many students into depression or other mental health issues. Mobile internet service is snapped literally on the drop of a hat. “It becomes difficult to study. And when there’s no internet I feel suffocated,” said Fatima, a first-year student of Chemical Engineering at NIT, Srinagar. “A Kashmiri student lives his whole life in uncertainty. You never know what may happen, if the examination will be conducted or not. We have never been introduced to something new, any activities, or anything to show our talent or skills. We are asked to stick to our academics and nothing else,” lamented Fatima. Going to school or a college is linked to what would have happened the previous day. “Class work remains suspended most of the times because of which a major portion of the syllabus is left uncovered. To compensate for the loss, most of the times we have to study by ourselves or the untaught topics are given to us as assignments,” said Sehar Iram, a final-year engineering student at IUST, Awantipora. It is this trend that was seriously compromised in the aftermath of the Lethpora car bomb in which 49 CRPF personnel were killed. In parts of North India, Kashmiri students were pushed into serious insecurity and humiliation as Hindutva brigade mounted a hate campaign. Over 300 Kashmiri students have left their institutions in Rajasthan, Uttrakhand, Punjab, Haryana and many other places and reached home in convoys arranged by concerned NGOs and individuals in Punjab. Around 19 students studying in various colleges have been expelled. Officials said more than 21000 students from Kashmir study in North Indian educational institutions. 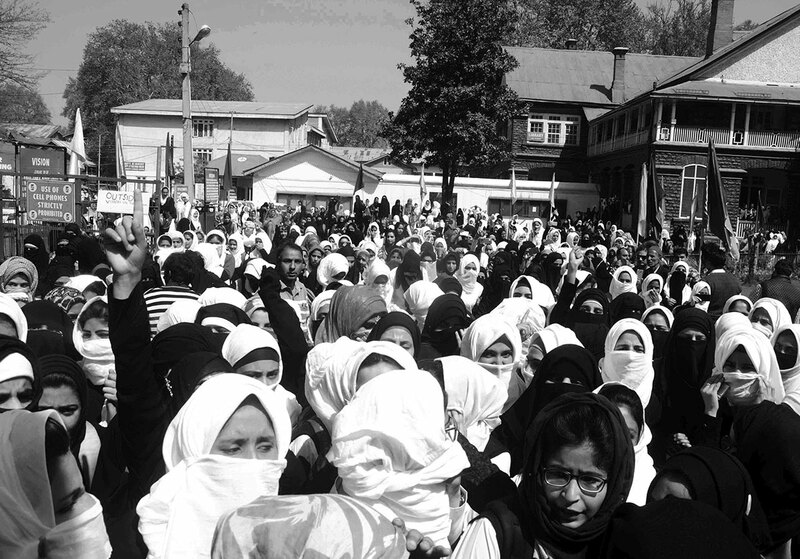 Students at Women College MA Road Srinagar. Salman Shaheen Charoo has been a student and later became a teacher in Lovely Professional University (LPU), Punjab. A resident of Sopore, he did his B Tech (Civil Engineering) and a diploma in English from LPU where he eventually started teaching English. He has been living an incident-free life in Punjab for five years. Shaheen put in his papers. Accompanied by his roommate Sajid Jameel, a final-year Biotechnology student at LPU, from Doda, he came home. Sajid recounts that on their way back, some people started following them. “As soon as we reached our apartment, we locked the door and entered through the window. We even switched off the lights. After about five minutes we heard people shouting that they were going to beat us. We were really scared and locked ourselves in the washroom,” he said. As the convoys carried frightened students from parts of North India back home, the tensions are still running high. While sections of the student who are nearing completion of their degrees are saying they will return to their campuses, those who had recently started are tense. Some of them are so frightened that they may not go back. How will they continue their studies, it is a question for the society back home and the government. It was after the Supreme Court directed the states to ensure the safety of Kashmiri students that the Prime Minister publicly spoke saying the battle is for Kashmir and not against Kashmir; this changed the situation to some extent. Even though Omar said that hate attacks still continue but the situation has started changing. A section of the students has started thinking about going back to complete their degrees. Besides, the situation that emerged in the wake of air strikes has also pushed the hate campaign aside.